A one or two day workshop featuring instruction in weaving with raw edges, piecing and Trapunto to make a striking contemporary 34” square wall hanging with a pieced border. The original is made of hand-dyed fabrics; kits from Pieces of Dreams are available if participants wish to use the identical fabrics. 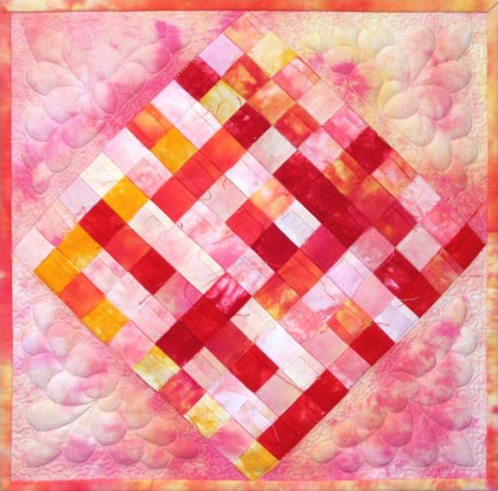 This class is for the quilter with intermediate skills. A 1- or 2-day class available. 1-day class results in a 14" piece with one woven block. Click HERE to download the 1-day class Supplies List. 2-day class makes a 34" wall quilt with 4 woven blocks. Click HERE to download the 2-day class Supplies List.